Why You Should Always Hire a Licensed Contractor – All Weather Mechanical Inc. Some people prefer the lower-budget option of handling home repairs themselves or hiring unlicensed contractors. But when it comes to home maintenance, the cheapest routes are not always inexpensive decisions or the safest routes. While these options may save dollars up front, they can put homes and families at risk. Manufacturers may forfeit warranty coverage if unlicensed work leads to a breakdown. Hiring a licensed contractor may cost you a bit more, but it is a long-term investment that will save you time, money and trouble. Licensed contractors have a lot to offer their customers. They have knowledge and experience through proper training and legal processes. They have insurance to cover mishaps that can happen on the job which include personal and bodily injury, and property damage. A licensed contractor will ensure that there is a signed legal contract between the two of you. This contract is a form of security that only licensed contractors can offer. They specifically plan, follow through and complete jobs, keeping communication open with the homeowner. Licensed contractors will take responsibility if things go wrong and stay with you until the job is completed to satisfaction. They are required to file permits for their work and an inspection is performed when the work is done. The permitting process is in place to protect the customer, without it, customers can be left high and dry with a project left undone with no recourse in sight. When it comes to purchasing a new HVAC system, the first step is to make sure the heating and air contractor is licensed in the State of North Carolina. Customers should ask for the contractor’s license number before service is performed. 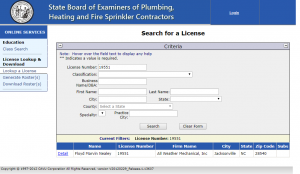 This license can be quickly verified online at the State Board of Examiners Plumbing, Heating, and Fire Sprinkler Contractors website at www.onlineweb.nclicensing.org. When the work contract is signed, the licensed contractor must apply for a city or county permit. After the work is done, the government inspector will conduct an inspection to ensure the system was installed safely and properly based on local and national building codes. This is a check and balance system which holds the licensed contractor responsible for the work while protecting the customer. Ultimately, trying to save a little money now could cost you a lot down the road. An improper service could result in a total breakdown of a system and forfeiture of the manufacturer warranty. When the time comes, choose a licensed contractor and save on worry and future costs from an unlicensed mistake.